Simon & Schuster, 9781439139332, 368pp. A gripping tale of international intrigue and betray-al, Eisenhower 1956 is the white-knuckle story of how President Dwight D. Eisenhower guided the United States through the Suez Canal crisis of 1956. The crisis climaxed in a tumultuous nine-day period fraught with peril just prior to the 1956 presidential election, with Great Britain, France, and Israel invading Egypt while the Soviet Union ruthlessly crushed rebellion in Hungary. 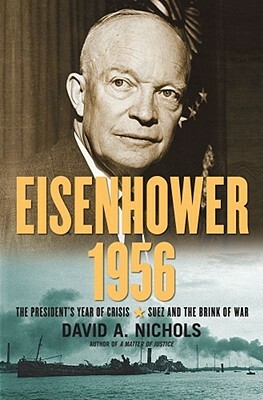 David A. Nichols, a leading expert on Eisenhower’s presidency, draws on hundreds of documents declassified in the last thirty years, enabling the reader to look over Ike’s shoulder and follow him day by day, sometimes hour by hour as he grappled with the greatest international crisis of his presidency. The author uses formerly top secret minutes of National Security Council and Oval Office meetings to illuminate a crisis that threatened to escalate into global conflict. Nichols shows how two life-threatening illnesses—Eisenhower’s heart attack in September 1955 and his abdominal surgery in June 1956—took the president out of action at critical moments and contributed to missteps by his administration. In 1956, more than two thirds of Western Europe’s oil supplies transited the Suez Canal, which was run by a company controlled by the British and French, Egypt’s former colonial masters. When the United States withdrew its offer to finance the Aswan Dam in July of that year, Egypt’s president, Gamal Abdel Nasser, nationalized the canal. Without Eisenhower’s knowledge, Britain and France secretly plotted with Israel to invade Egypt and topple Nasser. On October 29—nine days before the U.S. presidential election—Israel invaded Egypt, setting the stage for a “perfect storm.” British and French forces soon began bombing Egyptian ports and airfields and landing troops who quickly routed the Egyptian army. Eisenhower condemned the attacks and pressed for a cease-fire at the United Nations. Within days, in Hungary, Soviet troops and tanks were killing thousands to suppress that nation’s bid for freedom. When Moscow openly threatened to intervene in the Middle East, Eisenhower placed American military forces—including some with nuclear weapons—on alert and sternly warned the Soviet Union against intervention. On November 6, Election Day, after voting at his home in Gettysburg, Ike rushed back to the White House to review disturbing intelligence from Moscow with his military advisors. That same day, he learned that the United Nations had negotiated a cease-fire in the Suez war—a result, in no small measure, of Eisenhower’s steadfast opposition to the war and his refusal to aid the allies. In the aftermath of the Suez crisis, the United States effectively replaced Great Britain as the guarantor of stability in the Middle East. More than a half century later, that commitment remains the underlying premise for American policy in the region. Historians have long treated the Suez Crisis as a minor episode in the dissolution of colonial rule after World War II. As David Nichols makes clear in Eisenhower 1956, it was much more than that.